Perfume flasks were usually of silver or glass at this time but this one, carved in Germany in 1688, was of highly decorated boxwood. It is carved in a somewhat confused manner. 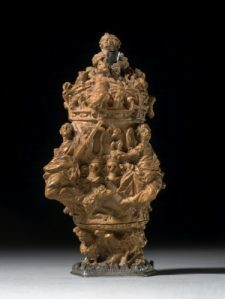 The upper part is in the general shape of a royal crown and is decorated with a seated female figure surrounded by three cupids. The body of the flask is divided into three by the figures of Faith, Hope and Charity. Between them are two pairs of heraldic crests (helmets) and a coat of arms, including a cross pattéé (spreading towards the ends), the Imperial eagle, demi-unicorn and a pair of horns. Overall is the shield of Austria. 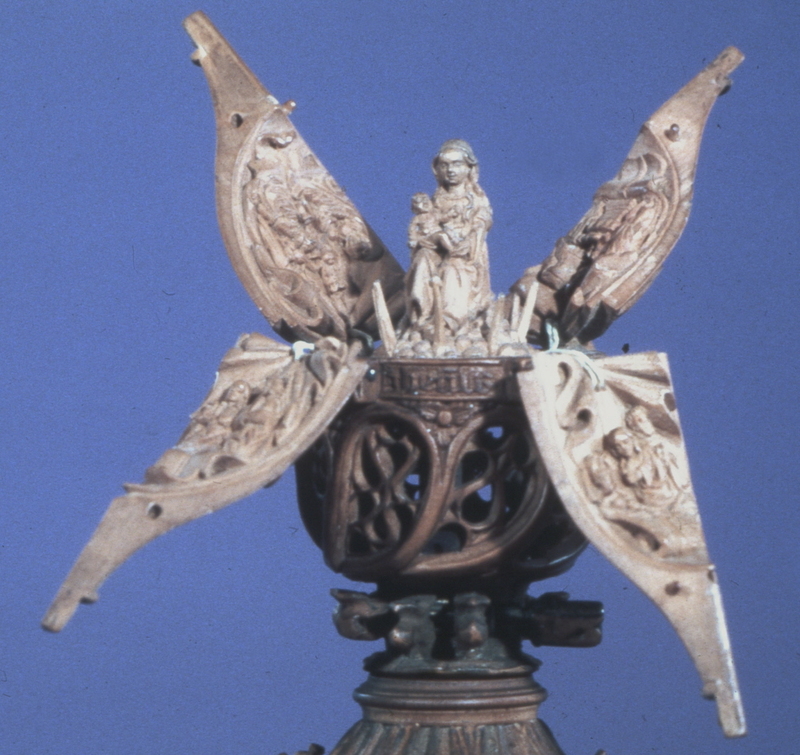 The base, which unscrews, represents the emblems of the Evangelists – an Angel (St. Matthew), the winged Lion (St. Mark), the winged Ox (St. Luke) and the Eagle (St. John). An altarpiece is a picture or relief on a religious theme, usually hung in a frame behind an altar of a church and often in two, three or more separate panels (diptych, triptych, polyptych). Sometimes an altarpiece is freestanding and set on the altar to act as a focus for prayer. Miniature altarpieces could be transported to the house of a sick or homebound worshipper or used at an earlier time of Christian persecution. 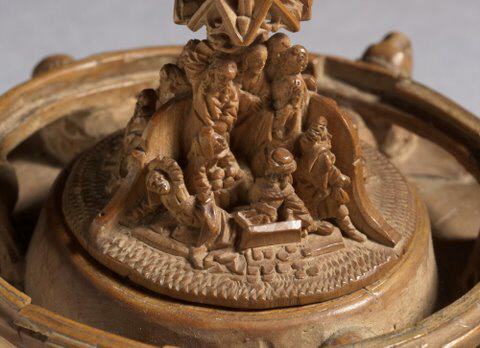 This miniature early 16C boxwood altarpiece is unusual for its time because of its Renaissance, rather than Gothic, details (fig. 1). It is astonishingly only 25.1 cm (9 4/5 inches) high, reaching, say, just to the shoulder of a standard wine bottle (fig. 2), and could easily have been moved to any dedicated religious site. 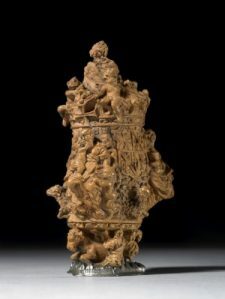 It is Flemish and was carved in 1511. The upper section is a triptych with ogee, s-shaped, arches. 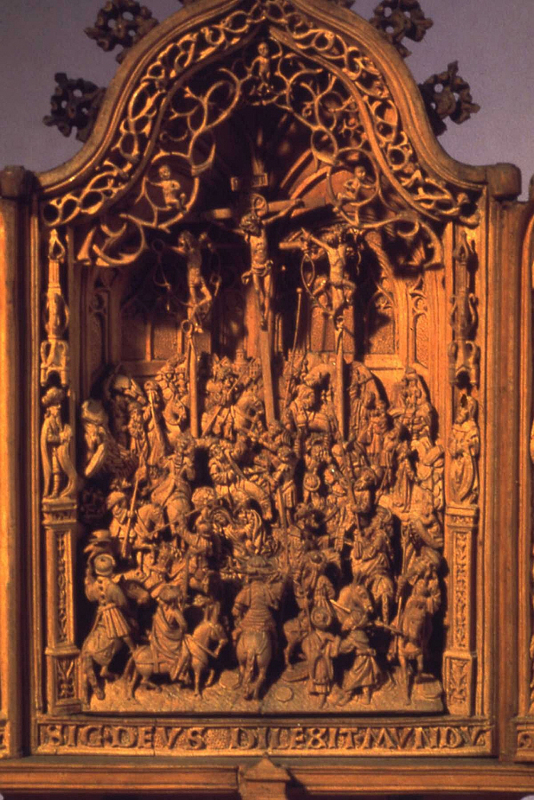 In the centre is the Crucifixion with the three crosses in relief on a vaulted background and with numerous figures in the foreground (fig.3). It has two doors. Inside the left wing, when opened out, is the Bearing of the Cross with the Sacrifice of Isaac in the background. Inside the right wing is the Resurrection, with the Entombment and other scenes in the background. The inscription below it reads: SIC DEVS. DILEXIT.MVNDV (So God loved the world). The lower second stage is a smaller triptych, carved in low relief with the Agony in the Garden in the centre and with the Betrayal on the leaves. This rests on a semicircular arcade with the Last Supper in full relief, the microscopic figures themselves being only 1.6cm (5/8 inch) tall. Each bearded disciple is different and individually carved with food plates and wine flasks on the table in front of them. On each side of the Last Supper are seated lions grasping shields. The rectangular base features wrestling children in the angles and the whole rests on two recumbent lions chained to posts. Between them is a shield with a crest (helmet) and mantlings (heraldic drapery). 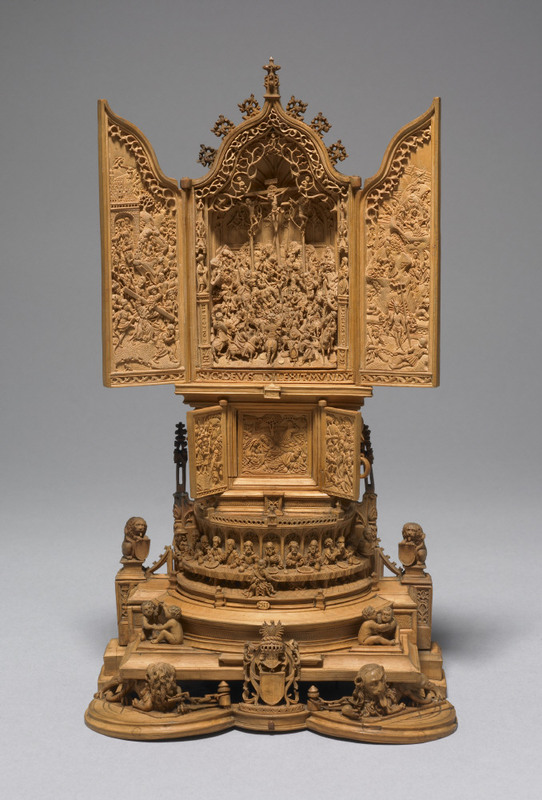 Arguably the most impressive of the Waddesdon Bequest miniature boxwood artefacts, this altarpiece is a fine example of 16th century Flemish boxwood sculpture with its extraordinarily skilful carving on such a small scale. A tabernacle was delineated by Moses during the Exodus from Egypt. A reproduction of that original tabernacle has been constructed in the desert 32km north of Eilat in Israel, following closely the description in the Hebrew Bible. It is a tent with a designated room for the Ark of the Covenant and an outer sanctuary containing a lamp stand, a table of shewbread (twelve loaves of unleavened bread, dedicated to God and renewed weekly) and an altar of incense. A portable worship facility was designed with similar intent. Christian tabernacles were secure box-like receptacles for consecrated bread and wine and had a covering, mimicking the original tent. 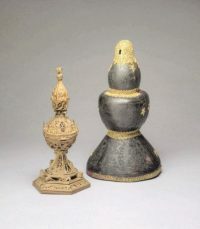 These portable tabernacles were carried to private houses of the sick or homebound or kept in a home that was used as a place of worship when the early church was persecuted. Later it was placed on the altar in the church to act as a focus for prayers. An oil or wax flame was kept burning constantly nearby. 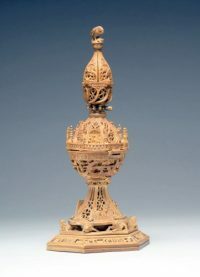 Pyx, derived from the Greek πύξος (pyxos, a boxwood tree, hence Latin buxus) and πύξις, (pyxis, a boxwood receptacle), was originally applied to all receptacles of the Blessed Sacrament of Bread and Wine. 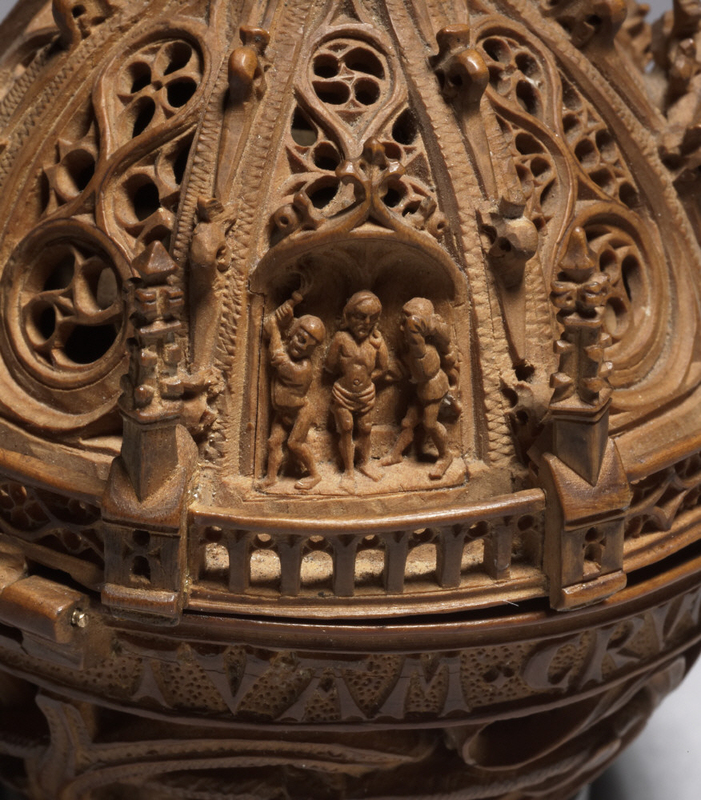 This miniature boxwood tabernacle in the Waddesdon Bequest (WB233) is carved with a multitude of scenes from the Life and Passion of Christ (fig. 1). Its egg-shaped body is surmounted by a long pear-shaped pinnacle and six crouching lions separate it from its hexagonal base below. The pinnacle is surmounted by a Pelican in her Piety. In medieval Europe the pelican was thought to be particularly attentive to her young, wounding herself to provide sustenance for them if necessary, and so became a symbol for the Passion of Jesus. 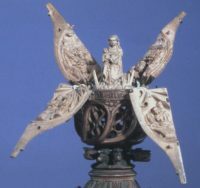 The pelican is removable, releasing four carved petals (fig. 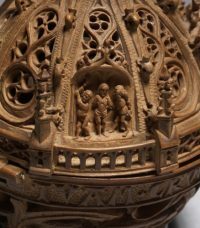 2) The outside of the petals shows foliage in relief and on the inner side are represented the Annunciation, Nativity, Circumcision and Adoration of the Magi. By means of a ratchet, a figure of the Virgin and Child then arises in the centre. The body is divided horizontally into two halves opening on a hinge. The outside is divided into eight arches filled with tracery and at the bottom of every other arch is a niche with a subject from the Passion (Mocking of Christ, Christ before Pilate, before Herod and Flagellation (fig. 3). On the inside are the Resurrection, Maries, Sepulchre, Crucifixion etc. The gallery round the middle is divided by eight pinnacles. The hexagonal stem (fig. 1) is carved with elegant tracery and has three scenes; Entry into Jerusalem, Agony in the Garden and Betrayal. 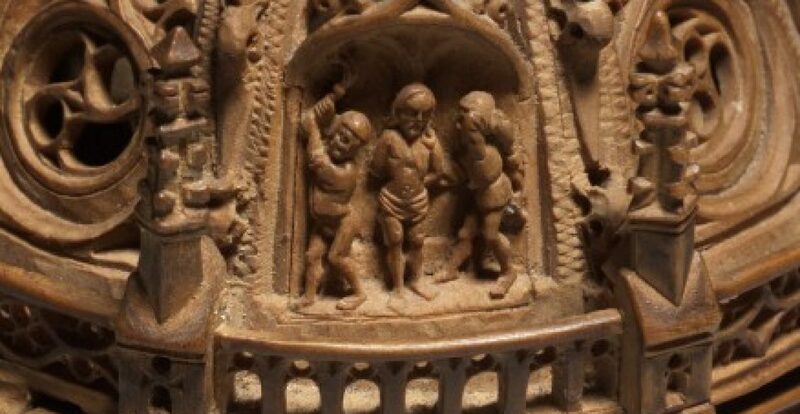 It fits into a ring supported by six lions and contains within it three scenes; Washing the disciples’ feet (fig.4), Scourging of the moneylenders and the Last Supper. The original case of cuir-bouilli (boiled, then moulded leather) shows the badges and coats of arms of Charles V, King of Spain and Holy Roman Emperor (fig. 5). This litany of full-relief carving would be memorable under any circumstances but the fact that the tabernacle is just 22.2 cm high, reaching only to the shoulder of a standard wine bottle, make it remarkable The meticulous skill of the C16th Flemish miniature carver is truly extraordinary.